Many years ago; my one and only Laser - sail no. 549. 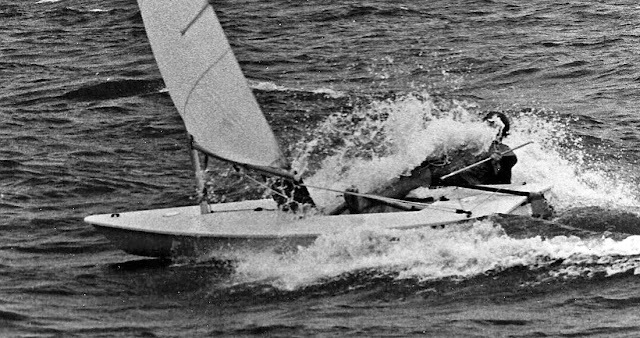 The previous header photo is of Aussie Matt Kiely sailing the Australian singlehander Sabre class dinghy. The photo was lifted from the South Gippsland Y.C.Facebook page. Probably the major trend in dinghy racing over the last 30 or so years has been the growth of singlehanded racing at the expense of doublehanded or triplehanded classes. And the trend since the millenium has been the explosive comeback of what I call the retro hiking singlehanders; those other singlehanded classes designed before, or around the date of the introduction of the Laser (1969). For the most part, these classes are not international (excepting the OK Dinghy and Europe Dinghy); they are popular country-by-country or region, and they attract fleets of thirty, forty or more boats at major championships. 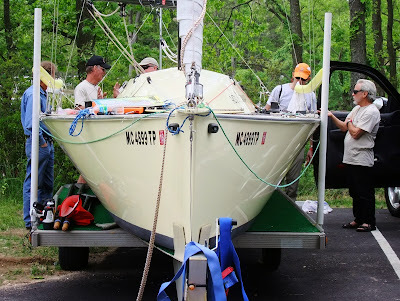 They have a builder or two turning out modern hulls, some have carbon masts, many have aluminum. They seem to fill a need in the marketplace that the Laser does not. 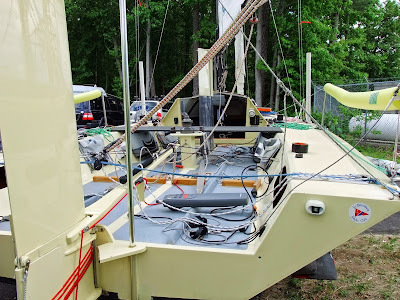 Last May I ventured over the Bay Bridge to Kent Island to look at Chesapeake Light Craft's OcoumeFest and also to look at some of the competitors in the inaugural WaterTribes Chesapeake Challenge long-distance along-shore marathon (an offshoot of their Everglades Challenge). They were starting that Sunday morning of the OcoumeFest. Of particular interest was the 17-foot i550 sport boat specifically built by the Gougeon brothers for these type of events. 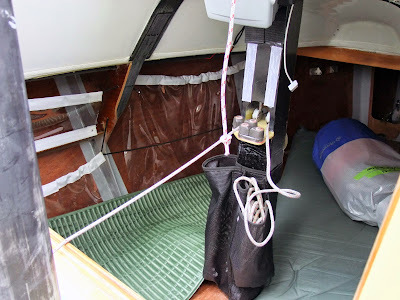 The race poses several challenges that a modern small sailboat is not normally designed for; low bridges, traversing very shallow water, human propulsion when the wind quits and for those endurance types, the ability to keep going on little-to-no-sleep. It is a race where it is tough for a sailboat to keep up with those machine-like kayakers who maintain a steady, grueling pace. 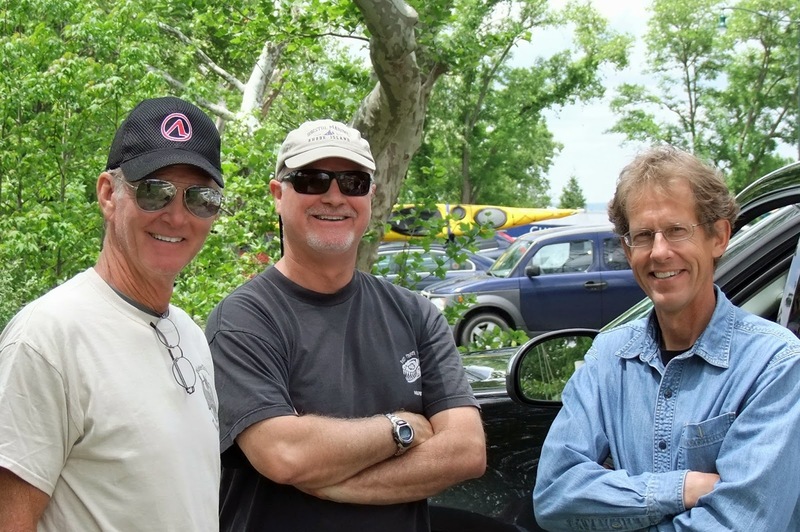 Bob Ames, John Z and I had an interesting conversation with the two sailors who were piloting the Gougeon i550 sport boat Hot Canary; Joe Frohock, the creator of the Mothmaran, being one of the team. Click here for the Gougeon article on building the i550 Hot Canary. Sixteen pages of study plans can be found here. The sleeping arrangements - just simple camp-mats laid on the floor under the cuddy cabin. This is Joe Frohocks life-jacket. The following live on his life jacket during the race. 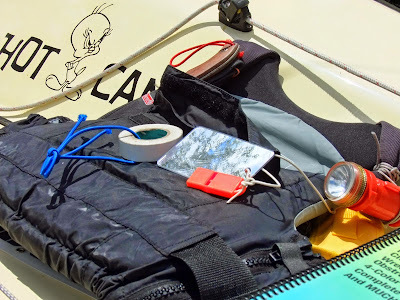 A very sharp serrated knife, electrical tape, a whistle, a mirror, a high-pitched rescue whistle, a waterproof flashlight (and several other items I've forgotten -I think he also had an EPIRB). A mast tabernacle so the mast can be quickly pivoted down to get under bridges. 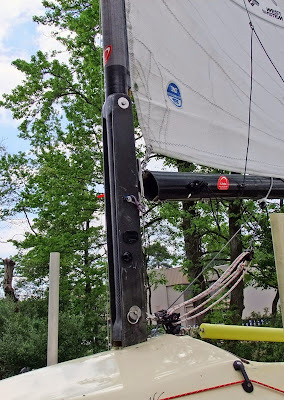 It turns out this wasn't quite enough, the freeboard on Hot Canary too high for one of the bridges in the race. They were stuck in front of one low bridge for several hours until the tide went out. 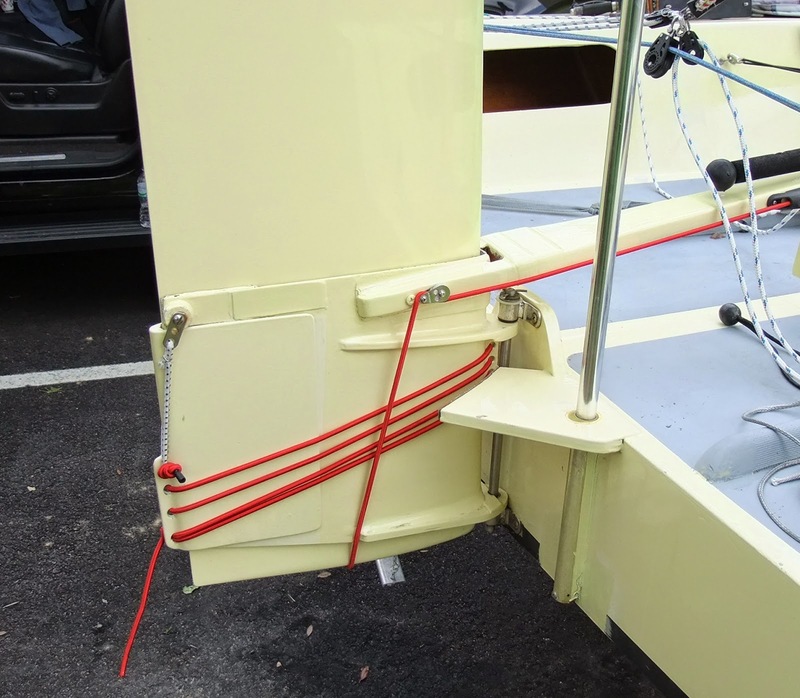 A rudder cassette allows the rudder to be pulled up or "reefed" for shallow water steerage. The mulit-part shock cord assemblage allows the aft part of the cassette to bounce back in case of a hard grounding. The sideview of the i550 sport boat. The i550 is specifically designed for home-building in plywood and has a flat bottom panel. The rowing station was a simple carbon plank that sat on the side decks, just behind the lifting daggerboard trunk. Rowing the i550 was not one of the design's strong points. The flare to the i550 sides can be seen at the transom. It's always fun to listen in when someone outside the sport of dinghy racing puts their two cents in. An English photographer, a landlubber if we go by his commentary, was drafted to shoot the Princess Sofia Olympic Regatta. He puts together this video where he airs his views of this strange sport. Trofeo Princesa Sofía IBEROSTAR from Sailing Energy on Vimeo. I noticed that Finn videos were popular in the bloggosphere a couple of months ago. Being somewhat late in following trends, I offer up one of my favorite Finn videos, this of Olympic sailing's free spirit, Estonian Deniss Karpak. Sailing in Lake Garda, on a day that appears to be solely devoted to training on downwind technique (lucky dogs those Olympians, to spend the day planing to and fro), our hero pauses to pick some flowers to decorate his centerboard before resuming the workout. Daybreak: Garda Adventures from Deniss Karpak on Vimeo.